Plastid genomes (plastomes) across photosynthetically active species are characterized by a remarkable conservation of structure, coding capacity, gene order and intron content. Exceptions to the general pattern, however, are seen in species that have abandoned the typical life style and live in special niches such as extreme environments or as parasites on other plants. The genus Cuscuta comprises exclusively holoparasitic plant species that are dependent on nutrient and water uptake from their host plants. While some species have retained a functional photosynthetic apparatus and are capable of performing photosynthetic carbon fixation up to the compensation point, other species have adapted to a parasitic lifestyle by the loss of thylakoids and of chlorophylls. In green species the plastid ultrastructure resembles that of chloroplasts of non-parasitic higher plants, whereas plastids of achlorophyllous species have an amoeboid proplastid shape and are filled with vesicular structures. In several species, their low chlorophyll content is camouflaged by high amounts of carotenoids accounting for a characteristic yellow colour. 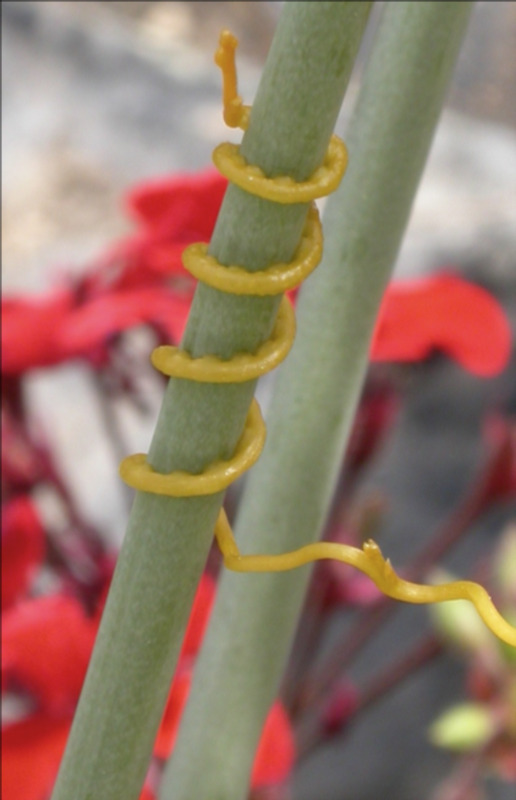 Plastid genome of a hot sulphur pond inhabitantPlastid genomes of several Cuscuta species have been sequenced in our lab. These sequences revealed a “plastomic striptease” which extends not only over coding sequences but also introns, RNA editing sites and regulatory sequences. The red alga Galdieria sulphuraria populates hot sulphuric vents and ponds and copes with its extreme habitats by a series of adaptations. Its genomes have been sequenced by next generation high throughput sequencing. We are comparing the plastid genome coding capacity, organization and plastid gene mutation rates of Galdieria to those of other red algae in order to find out how the special nice of this alga has influenced plastid genome evolution.